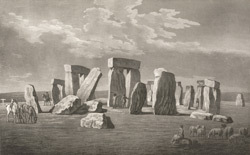 View of the stone circle in Wiltshire known as Stonehenge. Daniel Defoe visited the site in the early 18th century and while he could not add to the many theories already amassed as to its purpose, he still marvelled at its existence. He mused, "as the majority of all writers do", that is was "a monument for the dead ... because men's bones have frequently dug up in the ground near them ... [H]ow they came thither ... is still a mystery, for they are of such immense bulk that no engines, or carriages which we have in use in this age could stir them".